To help guide you through the complex Medicare program, each year the Centers for Medicare and Medicaid Services (CMS) releases the Medicare & You Handbook. The Medicare & You Handbook contains information on Medicare Part A (inpatient coverage), Medicare Part B (outpatient coverage), Medicare Supplements (Medigap), Medicare Advantage plans, Medicare Part D prescription drug coverage, and much more. If you find that you still need assistance after reviewing the CMS handbook, you can always contact us through our Online Help Desk or call a Medicare representative at 1-800-Medicare. Medicare should send you a printed copy of the Medicare & You Handbook in late September of each year, unless you have chosen to have the handbook delivered electronically. Your handbook should include information about the Medicare Part D and Medicare Advantage plans available in your service area. We have created this section of our website to provide information about Medicare in general based on the "Medicare and You Handbook - A Guide to Medicare". 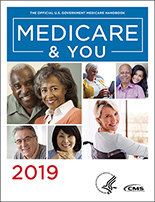 As reference, the following links can be used to download the national version of the Medicare & You Handbook -- this version is not service area specific. Remember that you can order a printed copy of the Medicare & You handbook by calling 1-800-633-4227 (1-800-MEDICARE). TTY users should call 1-877-486-2048. Past editions of the Medicare & You Handbook for research and reference purposes. What Are Medicare Advantage Plans (like HMOs and PPOs)?